As you may already be aware by now, Ubuntu 10.04 Lucid Lynx is coming with a music store called the Ubuntu One Music Store. This is a very new and exciting thing from Canoncal and understandably people have a lot of questions about this new service. So, the Ubuntu One Music Store team have come out with a FAQ about the store. Q: How is this different than Jamendo and Magnatune? Jamendo and Magnature will remain in the Rhythmbox music player. These are both great sources for creative commons and open licensed songs. The Ubuntu One Music Store extends the catalog of music available to Ubuntu users and will include mostly songs from minor and major label artists. These are songs that you typically find on the shelves of your favorite record shop...except in a downloadable format. Q: What are the details about the music in the Ubuntu One Music Store? You may occasionally find songs in WMA format. We're working with our partner to remove these songs from the Ubuntu One Music Store. Until this is resolved, we don't recommend purchasing these songs in this format. An MP3 version can typically be found by using the store's search feature. Some have asked for songs in other formats such as Ogg Vorbis or FLAC. Acquiring popular songs in this format was not possible at this time, but Canonical will continue to look for future opportunities to improve the quality of the songs found in the Ubuntu One Music Store. Q: How is the store related to Ubuntu One? An Ubuntu One account is required to purchase songs from the Ubuntu One Music Store. Ubuntu One accounts are free and come with 2 GB of personal cloud storage. Purchased songs are automatically transferred to your cloud storage, synchronized to all of your computers, and added to Rhythmbox. 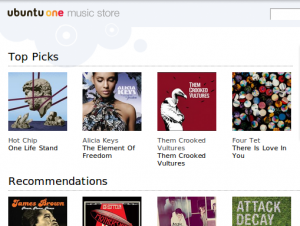 Customers will find a new library that contains purchases from the Ubuntu One Music Store. You can also fetch your music from your personal cloud storage through a web browser, just like all your other files. Integrating the Ubuntu One Music Store with Ubuntu One gives consumers the security of online backup as well as convenience of auto-synchronization. Please note that Ubuntu One synchronization does not support users who connect to the Internet through a proxy server. These users will need to download their purchases from the Ubuntu One website and manually add songs to their Rhythmbox library. Q: What regions of the world will be able to purchase songs? Most popular songs are licensed by territory (basically by country). Our starting territories will be the UK, US, Germany, the EU, and the Rest of World. Customers who use the EU store (users not located in the UK or Germany) will have access to purchase songs from two of the four major labels. Customers who use the Rest of World store will have access to purchase songs from independent labels. Canonical will analyze usage of the EU and Rest of World stores after the 10.04 launch to decide which territories would be best for expansion. Watch the Ubuntu One blog in the months following the launch of Ubuntu 10.04 for more information.